Sideshow's acquiring of the 12" Star Wars license for 2006 has been all the rage. Fanboys around the world are already arguing over whether the figures are good or not, although a production figure hasn't made it off the line yet. Considering the undeniable extremism of some fans, there's no doubt that once the figures do hit, that message board will turn into war zones. With all this hoopla, it's easy to overlook that Sideshow is already producing Star Wars products in their Premium Format line. These quarter scale figures are a mixed media format - little bit of cloth, little bit of resin, little bit of pixie dust. 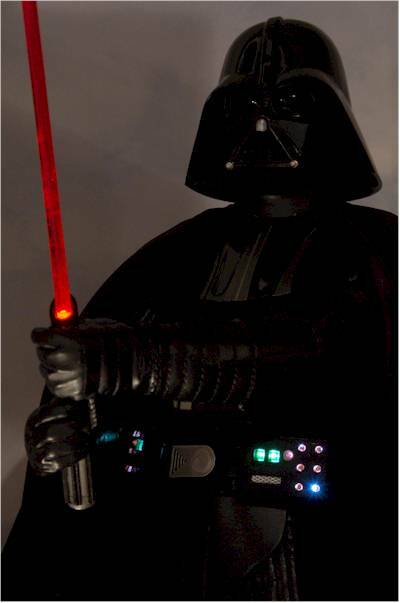 The latest release in this series is perhaps the most anticipated: Darth Vader. 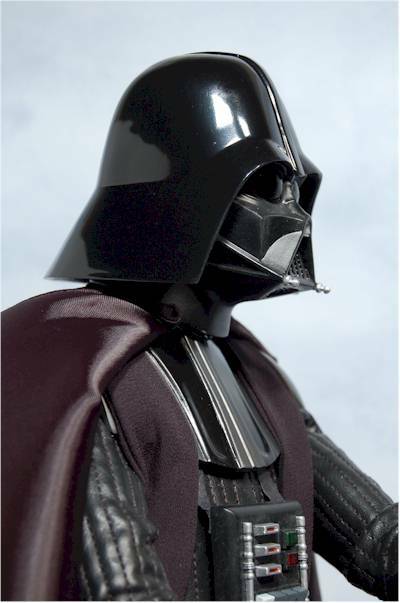 As with many Sideshow collectibles, Vader came in both a 'regular' and 'exclusive' version. The exclusive version included a quarter scale mouse droid, and was limited to 2000 pieces. That's actually quite a large edition size for one of their exclusives, and the regular edition size was only 500 more. Retail price on either version was $350. You can still get on the wait list at Sideshow's website, but your best bet is actually ebay at this point. 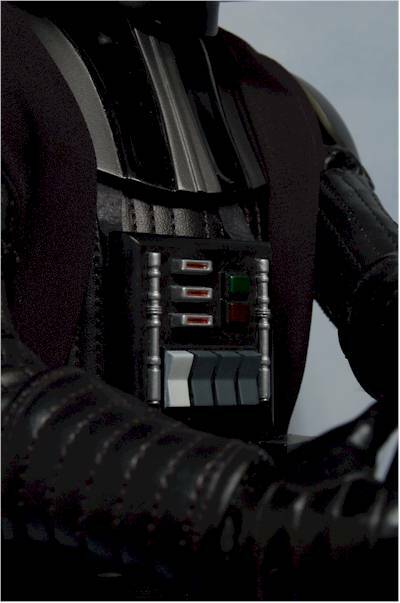 Regular collectors of Sideshow's Premium Format figures will notice a 'throwback' with the Vader packaging. Unlike other recent releases, he does not come in a nifty urethane style foam insert, but back inside a hard styrofoam container. It's quite possible that the styrofoam is actually more capable of withstanding damage and keeping the figure safe, but I know lots of folks like the softer interior. Another change back is in the outer sleeve of the box, which is now cardboard again instead of plastic. Not a big deal, as the graphics and text are the usual Sideshow quality, but worth noting nonetheless. 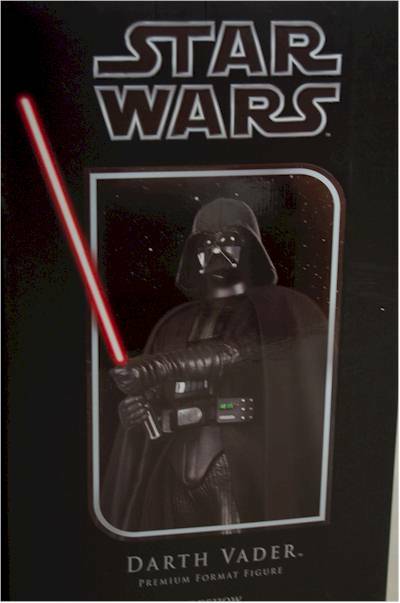 Vader's base has a high gloss black finish, and inside the box it is protected by a plastic cover. Some folks have reported that this cover has actually scratched the base, and I did notice some damage to the high gloss finish on mine. I'm not sure that the plastic is the cause though, as the finish damages fairly easily, and could have been a result of handling before being packaged. In any case, if you do find an issue with your base, I'd contact Sideshow's customer support. I do know that when I repackaged mine (my new basement refinish project is not yet underway), I didn't use the plastic cover and wrapped the base completely in soft tissue instead. Better safe than sorry. 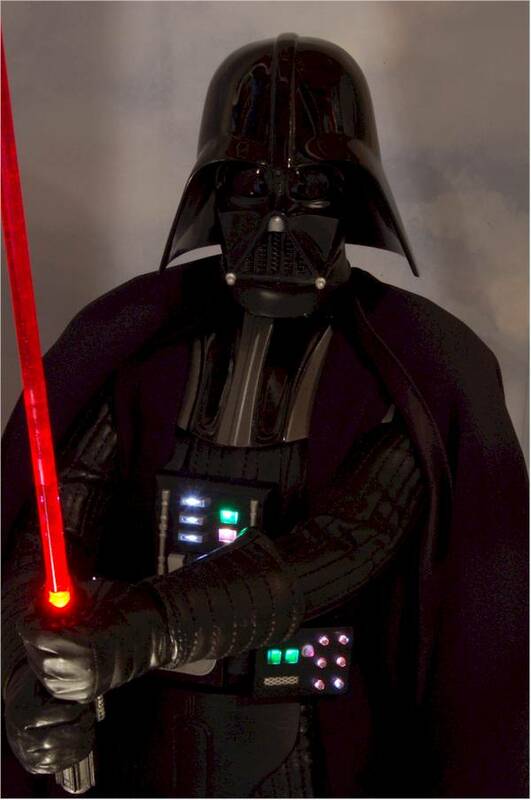 This Darth Vader is based on his first appearance in A New Hope (ANH). 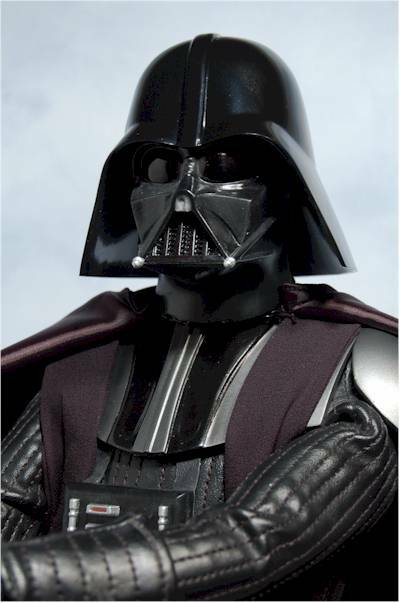 Like all characters, Vader's costume changed in subtle ways over the course of the four films he was in, and Sideshow had to pick one. This was as much a curse as a blessing, since the rabid fanboys will be able to find subtle details to latch onto if they are so inclined. There are a number of sculpted polystone pieces here, including the head, hands, armor, panels, and feet. The attention to detail is amazing, and this is some of the finest work from Oluf Hartvigson, who is well known as one of Sideshow's best sculptors. Is it perfect? No. Diehard fans will have minor nits to pick with the head and helmet, and some of the armor resembles his look in Empire Strikes Back (ESB) and Return of the Jedi (ROTJ) more than ANH. But to find these issues, you have to look extremely close, and even when you find them, you'll realize just how minor they are in comparison to the overall quality. I'm particularly impressed with the body proportions and style. When I first saw the pose, I was concerned that it wasn't dynamic enough or threatening enough for one of film's greatest villains. But once I had it in hand, I was impressed by the fluid appearance and excellent proportions. This figure is designed to stand alone, or as a companion piece to the upcoming Obi-Wan Kenobi Premium Format figure. If you actually have enough space someplace to display both of these figures together, it's going to make one hell of an eye catching display. The helmet and leg armor is done in a mirror-like black, with tremendous consistency and shine. I did find one small area on the back of the helmet that appears to be where the paint was touch while still wet, but it is very small and not noticeable except under very careful inspection. The rest of the black lacquer was very clean and smooth, with an excellent finish. Small detail work is also quite clean, particularly on the face and panels. The hilt of the saber was not quite as well done, with a little slop between the silver and black, but this was covered up by the hands when on display. My only other issue was with the black base. I did have some light scratches on the finish, although none of mine were serious enough to warrant a return. Inspect yours carefully though when you take it out of the box, to ensure the packaging didn't cause any issues. While you might wonder why I would even include this category for something that is theoretically a statue, it's necessary since some Premium Format figures do have limited articulation, such as Han Solo. However, Vader does not have any moving parts, and is in his one and only pose. While this category won't effect my overall score, it is important to note so that you don't break the arms in an attempt to move them. I'm counting two items as accessories - the light saber and display stand. 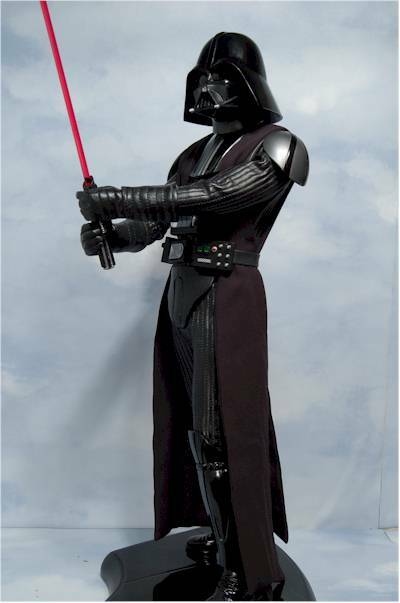 As I mentioned earlier, the display stand is done in a black lacquer finish, complimenting Vader's helmet and armor. One of the two feet attaches to the base with a metal peg and an connector for the electronics. It may take a little effort getting the two pegs to line up perfectly in the base, but with a little care I didn't have any trouble. Don't be in a hurry, and don't force it. The base also allows you to place batteries in the bottom, or plug into the wall with the included AC adapter. This is obviously to power the light up feature, but I'll discuss that more in the next section. The light saber has a nicely sculpted hilt, with a red translucent blade. The blade is NOT removable. The length is fairly good, and it fits tightly in his hand to allow for the plug to fit snugly. 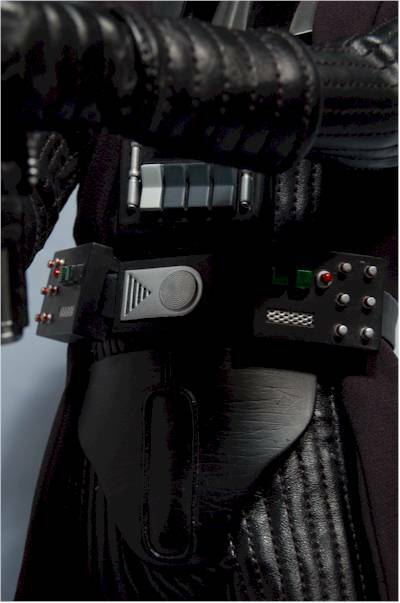 The mono style plug on the end attaches inside his hands to allow for current to light the saber. The hilt only fits in his hands one way, and it's a snug fit, so again, exercise patience when putting it together. If you picked up the exclusive version, you can bump this score by another half star. The exclusive comes with a properly scaled mouse droid, with his own small display base. The wheels are actually rubber and turn, a very cool addition! While the sculpt and paint are nice, it's the tremendous quality of the outfit that makes this item the visual treat it is. The leather pants and tunic are tightly glued to the underlying resin body, giving him a perfectly tailored look that's not possible with any sort of sixth scale design. The soft inner cape hangs beautifully from the shoulders and hips, cut to just the right length and style. 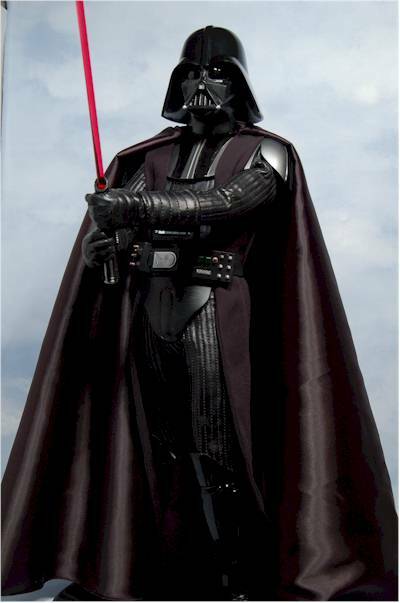 Throw on the outer cape, and you have a magnificent Vader. The outer cape is huge, with a dark black outside and soft, smooth interior. The stitching and quality of materials is excellent all around. The cape is held in place with a chain and hook, which are sturdy and fit tightly. Actually, the chain is a tad too tight, and could have used one more link. As it is, you'll need to be careful attaching it to avoid damaging the neck of the resin sculpture. It's really impossible to convey how great the outfit looks without having the figure in your hands. Pictures simply can't do this collectible justice, and it has a 'wow' factor that few other items in my collection possess. The base can either be plugged in, or you can place three double AA batteries (included) inside. 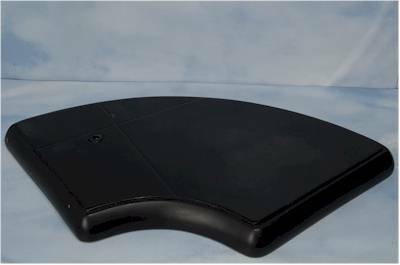 There is a large, sturdy button on the back of the base which activates the light up feature. Having either battery or AC power was a really nice touch on Sideshow's part, and is part of the increased cost. The saber and all three control panels light up. The lights on the chest and belt are very bright, great in terms of proper color (coming from a guy who's color blind), and accurate in detail. They do burn steady though, with no blinking effect. That's a pretty minor issue though, and one that didn't decrease from my enjoyment of the feature. The saber has a single light at the base of the blade. Unfortunately, this doesn't work as well as the rest of the light feature. The base glows brightly, as does the very tip, ala Harry Potter's wand, but the red plastic doesn't allow the light to glow evenly throughout. Those light sabers have always been a trick to get to look right in reality, and without making this figure cost quite a bit more, this was the best alternative Sideshow had. It is the one disappointment of an otherwise cool light up feature. This is a particularly tough category to score when dealing with extremely high end collectibles like this. Who's to say exactly what it is 'worth', and what can you really compare it to? We do know that other Sideshow PF style figures routinely run $250 - $300. However, regular versions are often cheaper than this on Ebay after they hit, selling for closer to $200 in many cases. In the case of Vader, you can find BIN prices on ebay for the regular at $300 - $350 right now, indicating to me that the pre-order price was a bit high, perhaps $50 or so. The run size on this collectible was also fairly high, which means you should be able to find one without paying a premium - for now. This particular category isn't going to factor into my overall score, but I thought I'd note it in case you were thinking about buying this for your six year old grandson. Uh, not unless you're going to put it behind locked doors. This is not a toy, but he'll love it when he's 10 years or so older. And if you know a 30 year old Star Wars geek, they'll give you their left eye if you buy them this as a present. This could be handy, depending of course on whether you like to run with scissors. Keep in mind that this is NOT an articulated figure, and there is no bendy arms or moveable neck. Be tremendously careful handling him, particularly since any pressure on the edges of his helmet could result in breakage. Patience and care are the words of the day when working with something this expensive. Be careful when attaching the cape, to avoid damaging the neck with the metal chain. Be careful inserting the saber into his hands to avoid scratches. Be careful inserting the pegs into the stand. You get the idea. There's nothing here that's wrong or poorly designed, but when dealing with something that cost you this much green, it's a good idea to take the slow and steady approach. I own just about every Vader ever produced, from all kinds of companies, including some that cost me a whole lot of bennies. None of them can come close to this figure in basic visual appeal. I did have enough minor issues with the paint to hold him back from a perfect four star score, since at $350 you expect perfection on all fronts. However, this figure will be a centerpiece in my new display, and would make an amazing addition to any home theater or media room. Even people with little to no interest in Star Wars will be impressed with this mixed media statue, and the addition of the light feature was just icing on an already tasty cake. If you're looking for some select items to add to your collection or decor that will actually make a visitor say 'wow', then this Vader should be on your short list. I own 8 or 9 of Sideshow's PF figures, and while Vader didn't quite snag the perfect score that a couple others have, he's easily my favorite of the bunch. Not too many retailers have the regular edition at this point, but I do know that Fireside Collectibles have them in stock for $355. 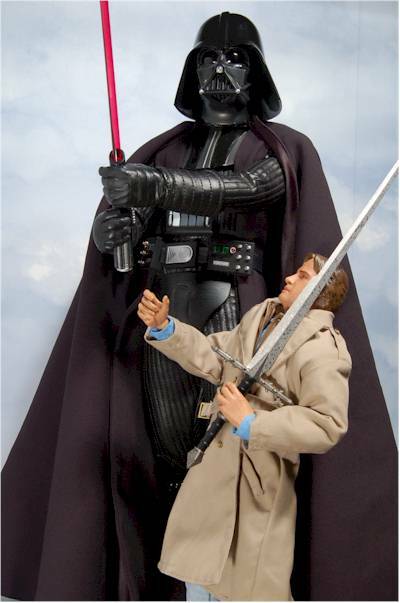 Alter Ego Comics also has a terrific sale price right now on the Premium Figure of Han Solo. I have also reviewed the PF Han Solo, and in other PF licenses, I have reviews of the Phantom of the Opera, Dracula, Frankenstein, Jason, and Vampyre (Nosferatu).